Senior Adam Jahn (12) leads Stanford into Los Angeles tonight for a showdown with No. 5 UCLA (Stanford Daily File Photo). 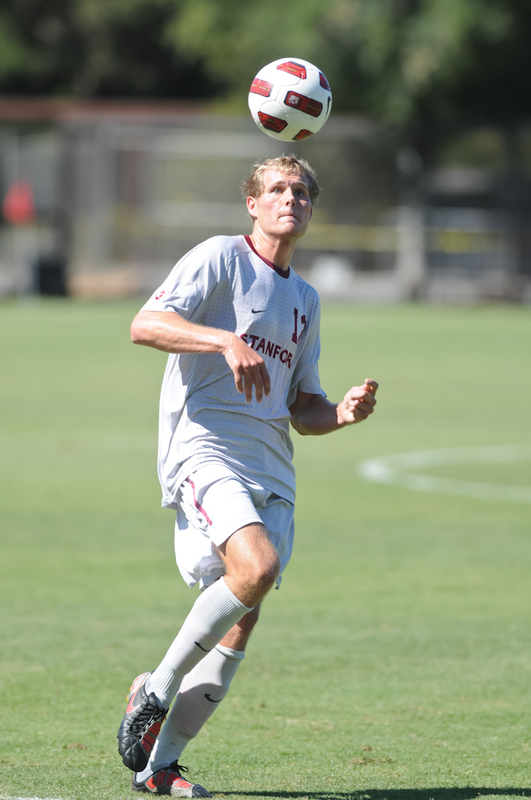 Stanford senior Adam Jahn, who led the men’s soccer team this season with a career-high 13 goals and 30 points, was selected by the San Jose Earthquakes with the 15th pick in Tuesday’s MLS Supplemental Draft. The Davis, Calif. native Jahn was invited to the MLS pre-draft combine and named among the top-60 draft-eligible players in the country, but he was very pleased to be selected by a team so close to home. Senior Adam Jahn was selected by the San Jose Earthquakes in the first round of Tuesday’s MLS Draft. (Stanford Daily File Photo). After helping Stanford make an appearance in the NCAA Tournament as a sophomore, the 6-foot-3 forward helped the Cardinal to a 9-8-1 overall mark, and a third-place finish in the Pac-12 with a 5-4-1 conference record. He was named to the All-Pac-12 First Team for his standout senior campaign, making him a four-time all-conference selection for his career. Jahn twice earned the Pac-12 Player of the Week honor in 2012, the second honor coming Nov. 13 after posting his first career hat trick, and the first Cardinal hat trick in 11 years, in Stanford’s 6-1 away win at arch-rival California. In the match Jahn netted the equalizer and go-ahead goals either side of halftime, then added the third by rifling a shot into the roof of the net in the 77th minute. Jahn, who started all 18 matches for the Cardinal in 2012, provided a team-best four match-winners on the year. His match-winners included Stanford’s away wins over ranked teams such as No. 11 UC-Irvine on Sept. 7 and No. 25 UC-Santa Barbara on Oct. 26, in addition to an 86th-minute winner in a 3-2 home win over Oregon State on Oct. 18. He ends his Cardinal career with 24 goals, 12 assists and 60 points. His 13 goals in 2012 is the highest tally for a Stanford player in 12 years. As Jahn transitions to the professional ranks, he said he expects to join the Quakes in their preseason camp on Wednesday. He considers Quakes target men Alan Gordon and Steven Lenhart as role models.